‘Sustainable’ coffee: what does it mean for local supply chains in Indonesia? Companies’ new ethical rules mean multinationals may benefit most. Coffee farmers may be bearing the costs of new regulations imposed by large multinational companies to make their coffee 'sustainable,' according to research published in World Development. By requiring farmers, processors, traders and exporters in the supply chain to provide proof of ethical practices, multinational companies are imposing costs on their suppliers, causing a demand for farmers at the end of the supply chain to reduce their prices. "It is reasonable to question the ultimate effectiveness of schemes, designed as tools of defensive brand management to deliver development benefits to disparate communities in the developing world," explained author of the study Jeff Neilson, from the University of Sydney in Australia. On the flip side, however, the increasing involvement of multinationals in the coffee supply chain could improve the links farmers have to the market, providing opportunities like introducing them to new tools and techniques for producing a better crop, and giving them hope for a brighter future. Unroasted coffee is one of the most traded agricultural commodities in the world; coffee was the world's seventh biggest agricultural export in 2005. As such, it has a big impact on millions of people worldwide, from farmers to consumers. Increased awareness of the environmental impact of growing coffee, and on the poor conditions of many farmers, has led to an increased demand for ethically sourced coffee. Companies keen to demonstrate their ethical credentials to consumers are requiring their supply chain to provide evidence of sustainable practices through certification, traceability and adherence to compliance systems. These rules, almost exclusively written outside of coffee producing countries, are having a considerable effect on the coffee industry worldwide. In the study, Neilson looked at the effect of an emerging kind of regulation – global private regulation – on the structure of the coffee industry in Indonesia. Since the article was published, increasing evidence has suggested that by opening up new international markets, like specialty coffee, multinationals may also be giving fresh hope – and ultimately a bigger paycheck – to coffee farmers. These outcomes, however, remain highly contested. Many of today's multinational coffee companies – including Starbucks – have developed their own 'Codes of Conduct,' and systems to verify ethical compliance. This means that members of their supply chain – including farmers, traders, roasters and exporters – need to prove that they are operating within certain guidelines. This has changed the 'rules of the game,' says Neilson. For the study, he interviewed 16 exporters, 31 traders and mill operators, 10 coffee farmer representatives, and several government agencies, industry associations and NGOs, to find out what effect the new global private regulation is having on the coffee industry in Indonesia. He found that larger export companies are better equipped to fulfill the requirements of the big coffee companies, so an increasing number of them are now multinational rather than local: in 2001, an estimated 70% of Indonesia's coffee exports were being controlled by foreign companies, up from 26% in 1997. And increasing pressure for certification is incurring extra costs, which these exporters need to recover either though premium sales prices, ultimately paid by coffee consumers, or through lowered prices at the farm-gate. "Certain organizations and actors are already emerging as key beneficiaries of these shifting 'rules of the game,' including producer cooperatives and multinational trading companies," said Neilson. "Cooperatives, however, are rarely the most efficient supply chain actor in Indonesia and farmers are often unwilling to aggregate under them due to associations with inefficiency and corruption." The research also highlights the emergence of new direct supply chain relationships between Indonesian farmers and large coffee companies. This, argues Neilson, "is one of the more exciting developments in the sector in recent years, as new avenues of information and knowledge exchange are opening up between these actors, which may ultimately provide significant livelihood benefits to farmers." Yet there have been very few independent and reliable impact evaluations of the effectiveness of these sustainability programs on the livelihoods of farmers. This is something Neilson will address in a new research project that will be carried out in Sumatra between 2014 and 2018, funded by the ISEAL Alliance. This video follows Dr Jeff Neilson's field research on the Indonesian island of Sulawesi, where an action-research activity has been undertaken to improve the rural livelihoods of coffee farmers through interventions along the value chain. Right now I manage the specialty coffee activity. Why is it better to produce specialty coffee? There's hope as long as there's specialty coffee. It requires extra work to produce this specialty coffee compared to normal coffee and it needs more labour. However, the outcomes make up for the additional work required. While it requires more work than regular coffee, the sale price is much better. What is involved in producing specialty coffee? We buy the fresh cherries, or what we call Kalebu coffee, then select only the red cherries, which are pulped and fermented for 24 to 36 hours. Then the coffee is washed, and if the sun is shining we will dry it for about 3 days. Then it's hulled and then dried again until the moisture levels are around 12-15%. And then we can get money from it. What do the farmers do, and what is the role of the cooperative? Farmers will only carry out coffee picking and sorting at the trees – I mean selecting the red cherries, the other unripe berries and also the ones that are too ripe. The cooperative will collect the coffee from remote areas with no transport, the nearby farmers will bring it in themselves. The cooperative will buy it and process it centrally to produce a high quality coffee product. How is the coffee tested for the international market? It's important that we maintain quality. After the sorting process, 500 gram samples are sent to the local exporter to test the cup taste of the coffee. After it is approved by the local exporter, it will be sent to our international partners for assessment on cup taste and be given a cup score. Once it's assessed as good quality, then we'll commence further negotiations. What is life like for the farmers? Things have got better because life is easier for the farmers with less work to do. Encouraging the farmers is important. Visits from international partners have a positive psychological impact in encouraging the farmers, they seem more eager to work because they consider there's a bright future for their coffee. Up until now they've been simple farmers without a clear grasp of what the future might hold. Now, this automatically inspires them and motivates them. A lot has happened since this research was published six years ago, so we caught up with author Jeff Nielson to find out more about sustainable coffee, and the direction the industry is now taking. In this podcast, Jeff Nielson from the University of Sydney, Australia, talks about the sustainable coffee industry in Indonesia and tells us how it's changed since his research was published. 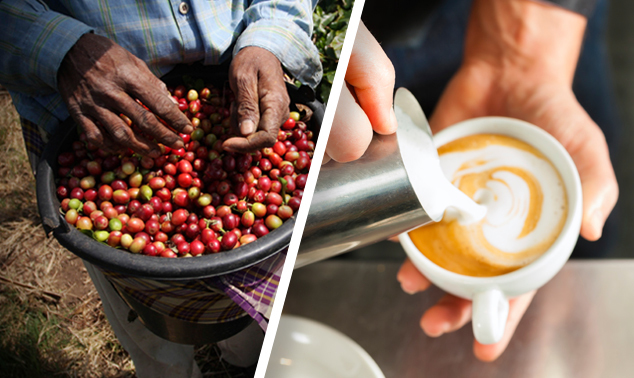 Sustainability and ‘Fair Trade’ are real buzzwords in the food industry, and in the coffee business in particular. Why is sustainability so important for coffee? It’s important by virtue of the fact that there are so many coffee farmers in the world. Probably 20 million households around the world are involved in coffee growing. And often they’re impoverished smallholders living in Asia, Latin America or Africa. Usually when we think about sustainability we think about their livelihood – people who are otherwise quite marginalized. So I guess that’s why it’s become a real trigger point for people concerned about sustainability. There’s also the issue of sustainable supply, and where we’re going to keep getting our coffee from. Over the last four centuries the volume of coffee being grown globally has increased each year. At some point you have to question whether that growth in output can continue forever more. Coffee is also grown in forest margin environments, so that expansion of production often takes place at the expense of natural forest. 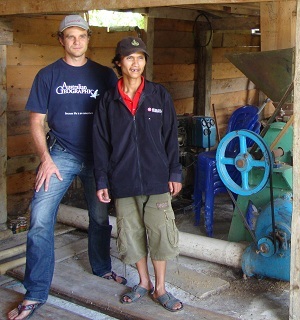 What first led you to investigate the coffee industry in Indonesia? I came to it by accident really. I wanted to do research in a particular part of Indonesia – I spent a few years in Indonesia as undergrad exchange student at the University of Indonesia. I wanted to do research in the Tengah region of Sulawesi, which is a coffee producing area. I wanted to understand the livelihoods of the people in that region, and I realized their livelihoods were intimately related to the dynamics of the global coffee industry. I needed to understand, therefore, how the global industry was structured, and how it was affecting the farmers. Could the industry itself benefit from taking that sort of view? I think the industry would benefit from recognizing that the majority of the world’s coffee is grown by smallholder households. And understanding their priorities, their decision-making processes, would probably be of benefit to the industry more broadly in terms of ensuring they do have a sustainable supply of coffee into the future. You conducted interviews with a lot of local producers, traders, millers and sellers – what did you find most surprising in those interviews? The article emphasizes three aspects of restructuring that was taking place: it looks at one, the way that the new forms of sustainability and private regulation were prioritizing cooperatives as a form of producer organization. And what was surprising… we have an idealized view of what cooperatives are and how they function. Whereas in the field, a lot of households were actually quite reluctant to organize themselves under the banner of a cooperative. The second aspect is looking at the increasing role of international trading firms, so the demand for sustainably certified coffee was actually leading to a comparative advantage for international traders who were more able to understand those needs and implement them. So there was a slight increase in the role of big trading companies instead of the traditional form of nationally owned exporters. And third aspect was the emergence of much tighter relationships between farmers and new exporting firms, which may also be multinational companies. That itself was a new relationship that hadn’t been there ten years prior to that. It was interesting to try to work through what that new form of relationship meant – it was akin to contract farming, where the big firms were dealing directly with local farmers, asking them to behave in certain ways. So the decisions being made in the frontier regions of Sumatra and Sulawesi were being increasingly dictated by norms and standards being set in Brussels or Amsterdam. What would you say has been the biggest impact of multinational involvement in the coffee trade? A: I suppose what it has done is it’s actually opened up opportunities. In the article I was quite skeptical over what this meant for farm house holders – a lot of industry actors at the time were also quite skeptical, saying this is just a new form of neo-colonial imperialism, with outside standards trying to impose values on us from the outside, which is true to an extent I think. But what it has done is it’s opened up a space of communication along the value chain. Of ideas, transfer of technology, and of new knowledge, and this is allowing farmers who would otherwise have been quite marginalized to be increasingly able to access new ideas about better farming practices. It’s been a while since your paper was published – what has happened since then? The most important thing is probably been a broad recognition from the coffee industry and NGOs and certification schemes that certification alone is unlikely to deliver significant benefits to farmers, and we need to be somehow embedding within these schemes some notion of service delivery. So in the past there was apparently one expectation that just certification alone would lead to premium prices and that would benefit the producers. Over time this notion that a farmer certified from Rainforest Alliance is going to be able to differentiate their product in the market has slipped a little bit. There are so many diff industry actors getting on board, and so many companies committing to source 100% sustainably grown coffee by 2020, so the element of product differentiation has fallen to the side. Traditional certification would say ‘have you used these chemicals in the last two weeks?’ ‘Have you gone hunting, have you hunted animals?’ ‘Have you cleared forest?’ These are all restrictions on their behavior, and that was the way it was often perceived. So the biggest shift I think has been from the companies themselves realizing certification alone – telling farmers what they can’t do – is unlikely to significantly improve their livelihood. Instead, it’s what sort of services can we deliver to farmers? Can we provide training on how to manage pests and disease in an integrated way? How can we improve soil nutrition by better composting on farms? And in many ways I think the earlier forms of certification, just as food safety is about making consumers feel better about the safety of the food they’re eating, certification schemes are really about making consumers feel better about the ethical choices they were making. Designed in some way to appease consumers, rather than being designed explicitly to assist farmers. I think that’s been the biggest shift. I would say that the various sustainability programs are in a state of flux at the moment, as they try to embed service delivery within the schemes. Will we ever get to a stage when all coffee is produced fairly? There is a difference between the dominant sustainability programs and Fair Trade – Fair Trade was specifically set up to enable farmers to sell at a higher price, floor price was developed a premium. And that’s still a very small aspect of the whole broader sustainable coffee. Advocates of Fair Trade would say it’s all unfair unless it’s certified Fair Trade. It’s one of the few that has a floor price, which is really important. And it also requires that a certain amount of money is spent allocated to a development premium. It’s an interesting thought experiment to think through where will this end – do you get to a stage where everyone’s cert? Does that therefore mean that everyone is happy? Satisfied with their lot? I would suspect not, even if 100% of coffee was Fair Trade certified, that doesn’t guarantee that the farmers themselves are entirely satisfied with the system. In Indonesia, for example, the families don’t really see coffee farming as a long-term solution to poverty alleviation – they often see migration, better education, moving to the cites, as being their ticket out of poverty, rather than continuing to grow coffee but growing sustainably certified coffee. A lot of the households in Indonesia are actually quite diversified, so coffee is one source of income, but often they might also be growing horticultural prod, or working in the local town or working as a laborer on a construction site. So the role of coffee within household livelihood strategies is probably a lot more diversified in Indonesia so you don’t get that high level dependency that you might in other regions. They also maybe engage often in own food production as well, which also provides another form of risk diversification. Looking ahead, what would you do to improve the situation, or the way the coffee industry players interact? For me, it does come back to embedding service delivery within the supply chain somehow. I think its quite an exciting area, because it is already happening, Interestingly, it’s happening more because of the corporate policies of particular companies, rather than it being forced upon them by the demands of certification schemes. So it’s companies that are quite concerned about long-term coffee supply, and also worried if coffee isn’t a viable livelihood option for these households then who ‘s going to be growing the coffee? So we need to make it a viable option, and that’s where the impetus for service delivery is emerging from. So, moving ahead, I guess developing more innovative platforms for how those sort of services can be delivered. And when I say services, I’m referring to improved agricultural knowledge on the one hand and how you test disease, soil nutrition. And also potentially access to finance. A lot of farmers in Indonesia are excluded from formal bank finance, and this can be problematic in terms of improving production systems. So there are some examples whereby buyers are also providing new systems of finance, whether it’s linked up with banks or directly from the buyers themselves. Even other aspects of financial management are starting to appear now, so it’s trying to assist farm households to work out allocations of resources that might be done to ensure greater levels of profitability on the farm. I guess for me that’s the exciting part moving ahead. And is it possible to somehow embed service delivery within these schemes? I know some of the large chocolate manufacturers wanted to include items within the schemes such as does the farmer have access to improved planting material? Which is an important aspect in cocoa production, but also in coffee. That’s not so much are the farmers doing something in particular, or not doing something – using a chemical for example – it’s more about is someone here offering service to the farmer by offering them new planting material? So maybe heading in that direction is where these schemes should be going in the future. It’s what the farmers want or need rather than what consumers or consumer organizations think they need. We’re just starting up a new four year research project supported by the Australian Centre for International Agricultural Research as well as the ISEAL Alliance, which is doing a study in South Sumatra looking at these questions about what are the impacts of sustainability programs on farmers’ livelihoods. So we’re trying to roll this out over the next four years in such a way that the designation of who gets enrolled in these programs is randomized, so we’re talking about trying to do a randomized controlled trial. This is a way of being able to work out quite clearly if there’s been any change in the livelihoods of the farmers, how that’s been impacted by programs themselves. So more of a quantitative assessment. And also looking at the way that other service delivery mechanisms might be being rolled out at the same time as cert, and more importantly why. Is that being driven by the certifiers, or is it being driven by the companies themselves? The general feel here is value chain intervention: How is it that the diff interventions enacted along a value chain may provide benefits to farmers in otherwise quite marginalized areas? So one aspect is this continued emphasis of the role of sustainability programs, but we’re also looking at other interventions. Such as a lot of specialty roasters in particular are developing direct linkages with farmers. Often in Australia, a lot of roasters will talk about the relationship they have with a particular group of producers in El Salvador or Indonesia. So we’re looking at the direct relationships between specialty roasters and farmers. We’re also looking at the use of geographical indications. Geo Indications is like an Appellation, which we’d be familiar with in wine – like the region of Champagne is protected as a geographical name. A number of these indications are now being established in the coffee industry, It’s interesting because in some ways the certification market is held by the producers themselves and authored by the producers. So we’re looking at the effects of these different interventions that are enacted along a value chain and how that might be changing or affecting farmer livelihoods in Indonesia. World Development addresses global problems like poverty, disease, environmental degradation and gender discrimination by publishing research into potential solutions, with constructive ideas and lessons from different nations, societies and economies. The journal's goal is to learn from one another, regardless of nation, culture, income, academic discipline, profession or ideology. What did the Editor-in-Chief of World Development, Arun Agrawal, have to say about the research? Regulation by governments is often viewed as costly and inefficient. Yet, social and environmental sustainability concerns demand some regulation of large scale agricultural production. Private regulation through voluntary certification, standards, and labeling perhaps most visible in the coffee sector. It is global, it is led by corporations and non-government organizations, and it takes advantage of consumer concerns about sustainability. The Neilson study is one of the earliest to document how private regulation in the coffee sector is bringing about structural changes for small producers. Focusing on Indonesia, the study shows that the demands of private regulation for better traceability, documentation, and audits are creating new costs. Private regulation favors producer cooperatives over individual smallholders, encourages exporter consolidation, and strengthens contractual relationships. The costs of these positive developments are, however, mostly being borne by producers. The study also shows the importance of work that compares the rationale, costs, and effectiveness or private vs. government regulation. An overview of regulatory changes affecting the coffee industry, and the policy tools available to solve the problems they bring. Do sustainability initiatives really help the people they're meant to? This study looks at the reality, and who's benefitting. Partnerships aim to improve production through standard-setting, but in reality they compete and, according to this study, can't help make coffee sustainable. This paper explores the pros and cons of voluntary regulation, suggesting that it's unlikely to make big economic impacts, but may help growers and traders cooperate better. Quality or mission-driven? This article looks at the reasons behind the recent growth in Fair Trade. As multinationals have become the main players in the coffee industry, this article looks at their approach to sustainability and taking responsibility for conditions in the supply chain. A film looking at the 'thin months' – poverty and hunger South American coffee growers.